Our Automation Systems provide control of the physical equipment so that everything is working safely and optimally together. Unique to our automation is that the scales and data management are completely integrated into the control system, eliminating unnecessary computers and ensuring that information is automatically supplied to the accounting system. Perhaps surprisingly, automation is not just for new facilities. Over half of our installations are at existing facilities that needed to improve throughput and safety while reducing headcount. We use top of the line equipment, including Allen Bradley ControlLogix PLCs and Operator/Machine interface programs like Wonderware. The HMI (Human Machine Interface) is the software program that graphically displays the equipment that the operator monitors and controls. Because we install so many of these systems, we are able to provide custom solutions using our library of pre-tested intelligent objects. This dramatically reduces programming time, long startups and eliminates software bugs that are so prevalent with other systems. The PLC (Programmable Logic Controller) is a specially designed computer, for use in industrial environments, that interfaces to the equipment and field devices. The PLC is mounted in a steel enclosure where the I/O modules are pre-wired to terminal strips. Our control cabinets are built at our factory and are UL approved for wiring and construction methods. SmartWatch is the most advanced hazard monitoring system available today! It monitors for leg and belt slowdown, belt misalignment and bearing temperatures for a variety of equipment including legs, belts, drags and fans. Network topology significantly reduces installation time and costs. SmartGate is the first intelligent gate that automatically corrects itself should it drift from its required position. 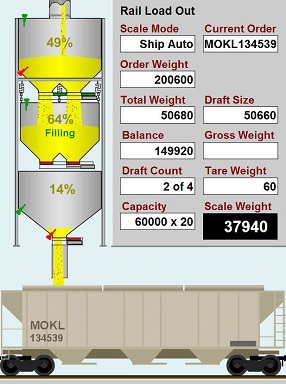 The system provides markedly improved results for customers like flour mills that require accurate and consistent blends. Like SmartWatch, network topology significantly reduces installation time and costs for new and retrofit applications. Automation you can afford. Reduced Costs, Increased Safety, Better Quality. Based on AB’s latest PLC system and GMS-4000.